Attending Mass last Sunday, my family-- all five of us --we were all seated in one pew when suddenly, a guy (looking debonair in his blue suit) sat at the very end of the pew. My daughter, who was just beside him, tried to scoot over and signaled us to move... but the stranger kept on moving closer to her and my daughter was all red and looked puzzled as to why is this guy trying to move so close to her. She then looked straight at the guy and he was so surprised to realize that my daughter was not his wife. He was two pews short... He apologized profusely and moved to where his wife was sitting... and the funny thing is, my daughter did not resemble his "real" wife. We couldn't stop laughing....even after mass we were still teasing her, much to her chagrin. It's one of those places where you go for the food, not the ambience. It's like one of those places Anthony Bourdain would frequent. You'll forgive this place for having long tables joined together for separate groups to sit at... and not so good customer service... because their Pho tastes amazing. My youngest daughter and son, who don't enjoy Pho as much, ended up ordering barbecue pork and shrimp over dry rice vermicelli noodles. However, upon having a taste of the broth from our Pho, they have changed their mind. We also ordered Vietnamese fresh spring rolls (a Vietnamese roll wrapped in rice paper), which we thought was above average, but we've had better. One of the dipping sauces (the peanut based tương xào) was too thick and salty. 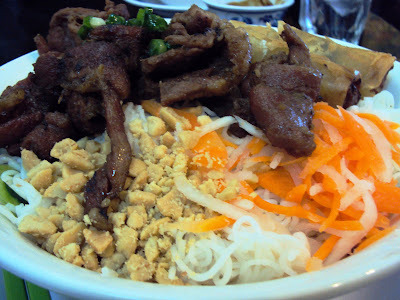 My husband preferred the fish sauce with vinegar dip or Nước chấm. 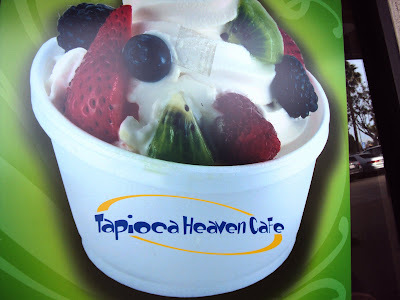 After chowing down a bowl of Pho, accross the street was this boba (or tapioca tea) place called Tapioca Heaven Cafe. Again, it's where you'd go when you crave for boba milk tea, smoothies, slushes and yogurt. About this small Cafe, well, I thought the seats could have been in better shape, and the decor was mismatched. 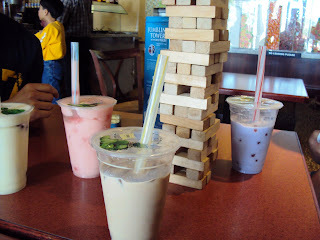 But then again, we frequent the place because of its boba. They have a wide range of bobas to choose from. Trust me, you wouldn't know what to order. 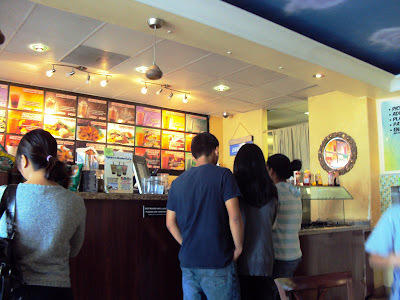 And among the boba places in San Diego, this is one of our favorite boba places. It's not watered down, service is fast... but yeah as I've said, the interiors needs updating. 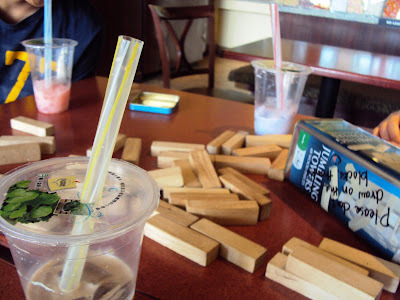 I've always been curious what teenagers do when they hang out at a boba place, especially since my daughter regularly asks permission to go grab some boba with friends and here's what I found out. 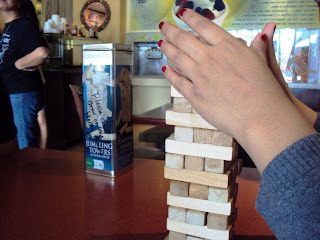 They play Jumbling Towers, a.k.a. 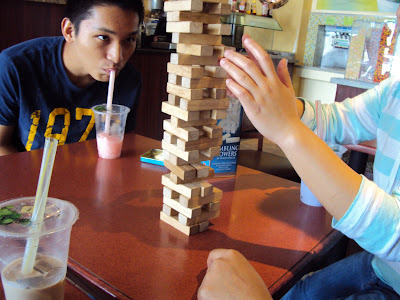 Jenga - the "stacking the wooden blocks" game, while enyoing their boba. YOU MADE ME CRAVE FOR PHO! I love Pho! I love hole in the wall joints. Good post! Pho is one of those dishes that I can't get enough of in the winter. It looks delicious! hi george! thanks gor dropping by..
hi christine! I'm so thrilled to see you again. thanks for stopping by. Over the past few years I've learned that the food is much more important than ambiance. :) I'll take good food any day over the look and feel of a place. And this food specifically looks amazing! I'm a pho fan, too! 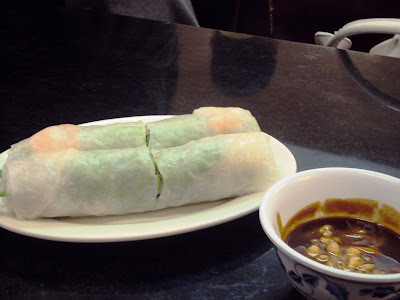 Your photos show what we almost always order: spring rolls, pho (especially w/beef tendon - yum!) and bun (the noodle salad). But I'm usually too full to order a dessert like boba. Now, you've set off a craving . 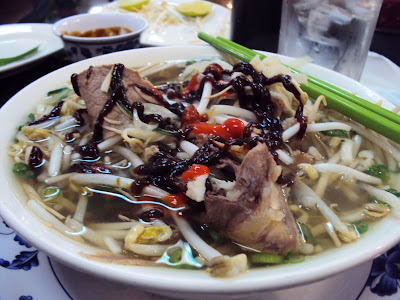 . .
All three kinds of pho look fabulous! This sounds like a great place! Lori: I totally agree with you! WE go for food more than the ambience. Tangled Noodle: I'm thrilled to see you stop by. You gotta reserve some space for boba... it's YUM! Hi Natasha! Great to see you again. Any roundups soon? Communal tables and perfunctory service? 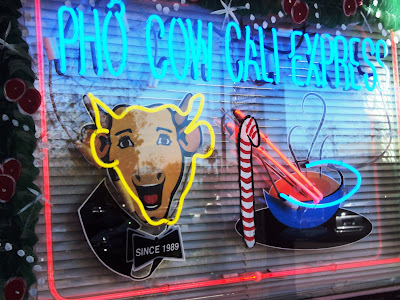 Sounds like the perfect pho joint to me! Thanks for stopping by my blog. I have to say the pork on dry noodles looks amazing too! It is a typical Pho place, good food indeed! Thanks for stopping by! sounds like a great vietnamese meal for all! Glad you have found your way to my site... see you around! This is delight full and Joanne being ur fren too, am inviting u here for her little party(its her birthday dear -i know that u know dear) which is a suprise party for her ...do leave her a wish in the sprinkles ok.....my feeds arent working so am trying my best to find all her pals to leave her a wish in the sprinkles before she gets there or even after....will ya help too to make it a little sucess....and leave her a wish too?